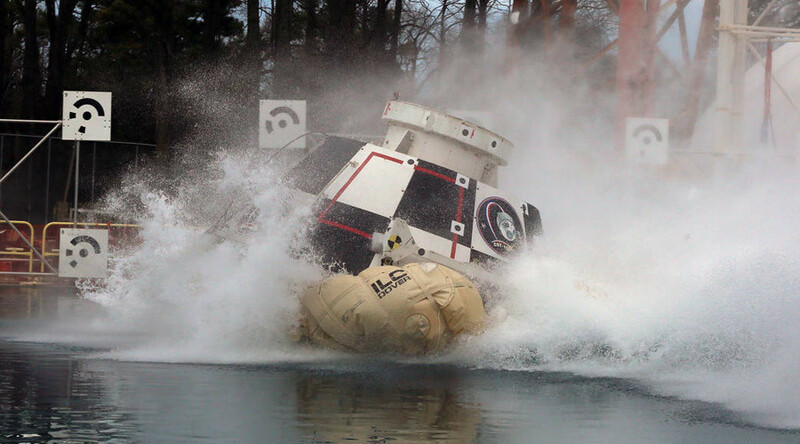 In preparation for the launch of NASA’s new astronaut-carrying CST-100 Starliner next year, the US space agency has been testing the spaceship’s crash landing capabilities by dropping it into water. The commercial craft, a collaboration between Boeing and NASA, is expected to boost American space travel by facilitating regular visits from the US to the International Space Station (ISS). Once operational, the spaceship will be able to carry up to four crew members, along with 220 pounds (99.8 kg) of pressurized cargo. Beginning in 2017, the Starliner is expected to make at least two trips a year to the ISS. On Wednesday, NASA released an image of the large capsule making a splash landing at the Langley Research Center in Hampton, Virginia. The pod-like capsule is designed to touchdown on solid ground, but NASA say they are testing out the Starliner’s ability to crash-land in water should an emergency arise during a mission’s takeoff or landing. “Testing allows engineers to understand the performance of the spacecraft when it hits the water, how it will right itself and how to handle rescue and recovery operations,” the agency said in a statement. Last year, Boeing released the full details of its futuristic vessel, which is still being developed at the Kennedy Space Center in Florida. The project is part of NASA’s ongoing efforts to find a suitable – and more affordable – substitution for the now-defunct space shuttle program.